At tention to anyone who will ever need to feed a baby or child: get this book! 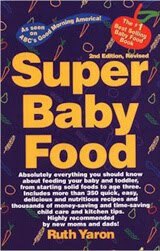 I was given a copy of Super Baby Food, by Ruth Yaron, after my daughter was born. My cousin had heard such great things about it at her mom’s group that she thought I might enjoy it as well and bought it for me. The term “enjoyment” doesn’t do justice, though. “Need” would be much more suitable. the reasons behind all of this advice! The style that Ruth writes with is easy to understand, dusted with humor, and full of researched information. I appreciate it from the practical standpoint of a mother, and also the medical standpoint of a paramedic. Every parent or caretaker of babies through toddlers needs this book. It is your one stop shop for knowing everything about feeding your child. Your baby is worth knowing the how, what, when, and why of eating. It’s hard being away from my baby while I’m working, but it’s a lot easier knowing that I’m providing good food for her. Head over to Ruth’s website at http://www.superbabyfood.com/ and let me know what you want to learn about that’s in her book. Be sure to include your email address in your comment to me! One winner will be chosen at random on Sunday, June 14 at 12:00 EST.